Ehsan Sehgal born Khawaja Ehsan Elahi Sehgal is a Dutch-Pakistani origin Urdu poet and writer who moved to The Netherlands in 1978. He is also a journalist and activist for democracy and the freedom of the press and of speech., He was born on 15 November 1951 in Larkana, Sindh, Pakistan and obtained a Bachelor of Arts and Master of Arts in Urdu literature. In addition, he also received the LL.B. law degree from Karachi University., He has received awards from Indian and European Urdu literary organisations, in recognition of his literary achievements, and is famous for his poetry book Zarb-e-Sukhan, in the Urdu-speaking world. The Daily Times describes the book as a "splendid poetry collection." Besides that he has published a collection of aphorisms in Dutch, English and Urdu., Moreover, his many ghazals and naats have been composed and sung by various singers of Pakistan. 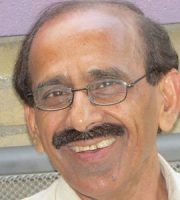 Sehgal has also written a novel and several books of poetry; his articles have been published in various Urdu newspapers.